Following the success of the teaser mini-album “One Year & A Day – The 5inch Files” that gained worldwide attention despite its limited pressing (a hand-numbered limited edition vinyl release, and the first ever 5inch series! 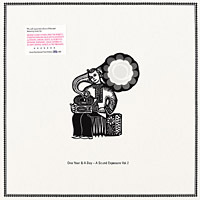 ), Equinox Records finally drops its second full length album, the second part of the sound exposure compilation series: “One Year & A Day – A Sound Exposure Vol.2”. Handpicked from a motley stack of demos and promotional CDs, Günter Stöppel (aka DJ Scientist), the founder of Equinox Records, assembled a product that features 14 outstanding tracks by some of today’s most cutting-edge artists and producers. Spanning various genres and aesthetics, the compilation is as breathtaking in its breadth as it is in its execution. Whether it be a folk-rock inspired breakbeat banger such as 2econd Class Citizen’s “Wishing Well,” the forward-thinking electronic prog-rock tune “Times Like This” by Free The Robots, the original post-instrumental Hip-Hop track “Tibetisches Gutenachtlied” by Aqua Luminus III., or the thrilling “Octobre” by electro/IDM-wunderkind Geste, the second volume of the series succeeds in representing the pioneering ethos Equinox strives to uphold. Likewise, Arcsin’s rock ballad “Scarlet Fever” juxtaposed with the bitter-sweet lyrics of Deadpan Darling’s pop song “Laugh Track,” Emynd’s inexorable electro tune “Identity Through Alterity,” or the classical cinematic introduction by the famous 60s rock group The Peddlers, the “One Year & A Day” compilation covers a diverse range of styles and genres, illustrating the amalgam of sound Equinox is known for, resulting in nothing if not one of the most distinct and forceful collections of songs within the past several years. This is the song that gave this compilation its name. Recorded in 1972 with the London Philharmonic Orchestra and released on the Album “Suite London” it was sung by the legendary composer and lyricist Roy Phillips. His unique and inimitable voice makes it the perfect intro for “A Sound Exposure Vol.2”. It’s time for a change and we’re back: bigger, better, and louder. Equinox 2008. “A Different Direction” is the wake-up-call of this album. “Times Like This“ is an insatiable drum inferno that leaves you begging for more. Taken from the very limited Free The Robots debut-cd “The Prototype”, this track is THE electronic progressive rock song for the year 2008 and beyond. The vocals are sung by Phil Nisco. 2econd Class Citizen is the master of contemporary electronic folk rock, and “Wishing Well“ is the genre’s prototypical hymn. In true postmodern fashion, because of a harddisk crash, the final version of this seemed to be lost forever. Now, one year after the release of an unmixed version on his EP „Wyred Folk“, we finally get the official version of this classic. Descry or rediscover: “Wishing Well“ is one of these songs, that won’t let you pass by unaffected. Since the label’s early days, the music of New York’s Arcsin accompanied me and Equinox. Who said he was too progressive and dark? His most recent album “Oculus Fang“ is a paragon of perfection, and though the noteworthy anthem “Scarlet Fever“ might be more accessible than most of his other work, the song still reflects the cold, brazen sound of post-9/11 New York. This is this album’s love song. “Cavernous“ is not a merely skit, but an awe-inspiring and fascinating fragment of sound–full of tension and energy, blazing with anger and stirring your blood to just let you return back into a fair and beautiful dream. Deadpan Darling is the music of Kingston and Ian Taggart a.k.a Blue Sky Black Death with the vocals of Ceschi Ramos of Toca and Anonymous Inc.. Ceschi travelled with Equinoix on the 2007 Tour and “Laugh Track” finally solidifies him as a recorded part of the label, making him the first vocal artist on Equinox. The bitter-sweet lyrics and the dallying-minimalistic production make it one of the album’s centerpieces. “Laugh Track” tells the story of somebody trying to escape reality; a story about battling the monotony of life. Wouldn’t it be nice to be constantly followed by laughing or a soundtrack in your head – something that nobody else could hear – a little push to get you through our often mundane reality? With “Dignity of Men“ Deckard takes his sound to the next level. His typical sequential drums, a pulsing, hummy bass, an energetic guitar sample and a perfect arrangement make it one of the most barnstorming tracks ever made out of a breakbeat. The original version of this track is found on the first DJ Sept demo that I received from a mutual friend. Finishing the revisited version for his EP “A Promise Never Given” was a long, hard endeavour, but it was certainly worth it. In my opinion, “Morning Comes (Revised)“ is a perfectly composed instrumental masterpiece. It has tension, energy, and emotion, all combined in a way that only Sept is capable of producing, fitting complexity with minimalism flawlessly. Emynd’s quest for the perfect beat isn’t over yet. “Identity Through Alterity” is five action packed minutes, garnished with breaks and 808-claps. This is the grand finale. It’s like a movie’s end at the cinema: you don’t want to get up from your cozy seat.